Get better earnings, tips, and ratings by handing out products ordered from your mini convenience store. Install the box, have riders order from the Cargo Store website, then hand out their products. Earn from each order, even with free items. Receive a Cargo Box filled with products and access the Cargo Store website. We keep track and automatically send you products when you’re running low. All orders go through the Cargo website. Earnings are directly deposited every week in your bank account too. We have several locations nationwide where you can meet and talk to a Cargo Team Member. We can help you with any feedback, questions or concerns. *Drivers will only hand the products to riders when it is safe to do so. Drivers may not complete any transactions on airport property. Listen to what these drivers have to say about the Cargo Box. Cargo has been a blessing! You guys help me pay for my oil change, gas, and new tires. I really appreciate the service you provide. I live in a college town and the students are going crazy over Cargo! My riders are so impressed with the amount of effort I’ve put in and respond through ratings, compliments, and tips. Goals met! Everything Cargo has said they would do, they’ve delivered on. My ratings have gone up, my tips, have gone up, and I’m making more money! The bright shinning box is like a magnet every time people get in the car. Passengers are so excited that I have products in the car but are ecstatic when they realize they can get products for free. I’m really excited to be a part of this so keep up the good work! There’s definitely no more awkward silence rides it’s a great conversation piece thanks for such a great idea! "I literally have to do nothing except pass out cookies and collect money. So this one’s a no-brainer." 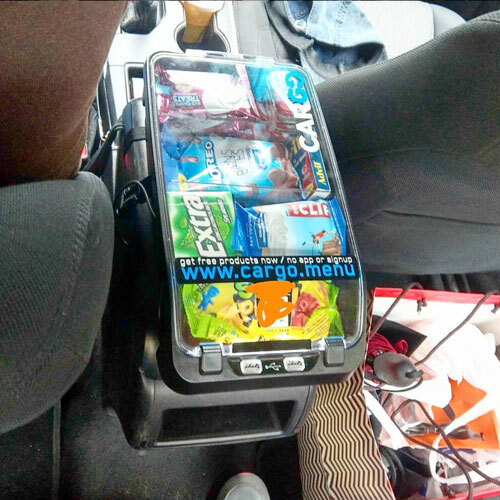 "Cargo Box is a great way to boost your ratings, increase your tips, and improve your passenger’s experience overall." "Cargo lets drivers sell goods like snacks and personal care items to riders"
"Cargo enables drivers to earn extra money and potentially receive higher ratings"
"He earns an additional $100 to $300 per month by using Cargo, which pays him a monthly rate for selling products like snacks and headphones to passengers." "Uber and Cargo are Teaming Up to Raise the (Protein) Bar"
earning extra money with the Cargo Box. Does the Cargo Box and its products cost me anything? No. The Cargo Box and its products does not and will not cost you anything. Why can't I just buy my own products and sell them myself? First of all, you'll need to buy your own products. Then you need to keep track of them and figure out a way to collect the money. Lastly, you have to deal with expired items. Cargo does all of that for you. How can I get more products? Cargo's proprietary software automatically sends you more products as you start to run low. There may be delays if our system is still learning your selling history or if we're in the process of preparing a replacement product. Can I return the Cargo Box? Contact Cargo Support at support@drivecargo.com to receive a prepaid return label if you no longer wish to use the Cargo Box. © 2019 Cargo Systems, Inc.